Posey manufactures these wedges with sewn-in zippers so they can zip together with other Posey Rail Covers. 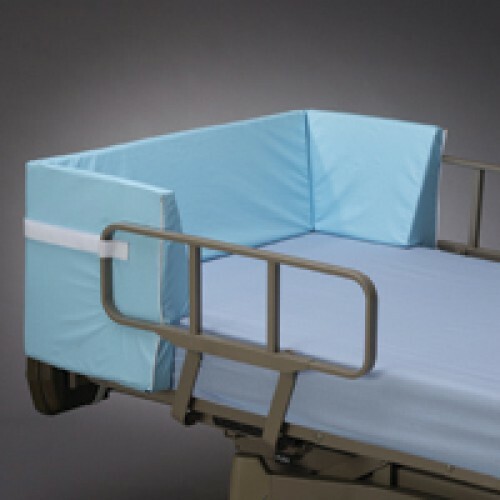 In addition to padding hard headboards, footboards and side rails, these wedges also fill dangerous gaps between these areas and the bed mattress. These Wedge Pads attach to the bed with hook and loop straps. They include vinyl coverings that can be easily cleaned with liquid detergents. They come in two styles, one style with a universal fit (item# 5730) and one style made specifically to fit Hill-Rom beds (item# 5731). Each wedge is sold individually. See additional wedge specifications below.